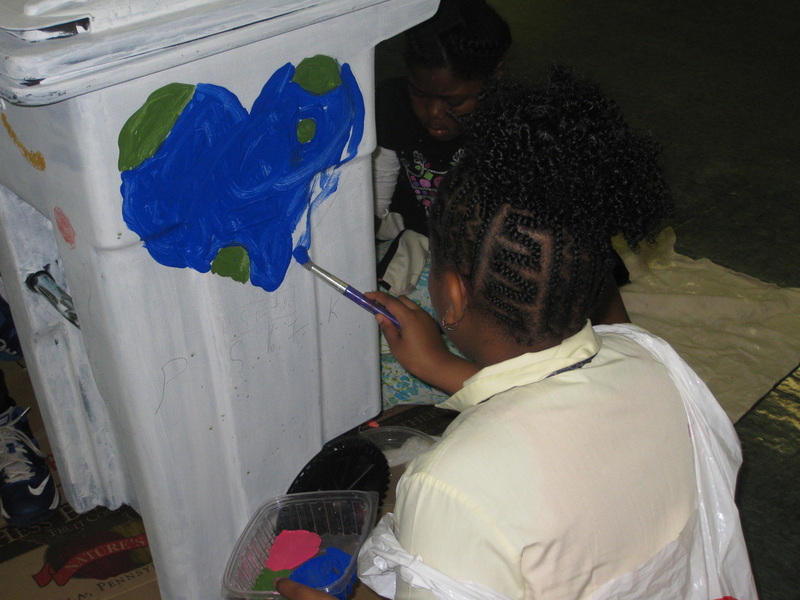 Help us to bring more environmental STEM education to underserved students in New York City. 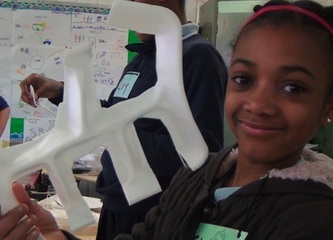 Our Neighborhood: a Better, Cleaner Life - by 6th graders from Cafeteria Culture on Vimeo. 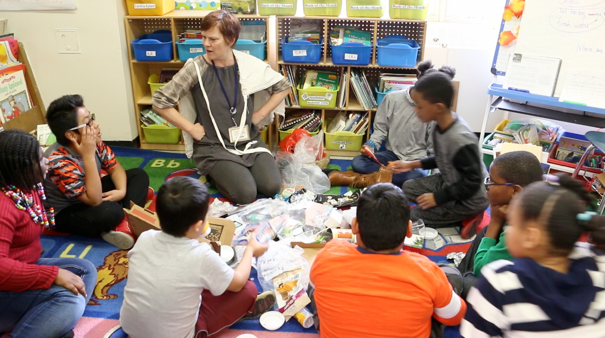 Rhonda Keyser, Cafeteria culture teacher, pilots a new version of Cafeteria Culture's "Garbology 101" lesson at PS 15 K, where she dresses up as the Mayor and a Sanitation worker. 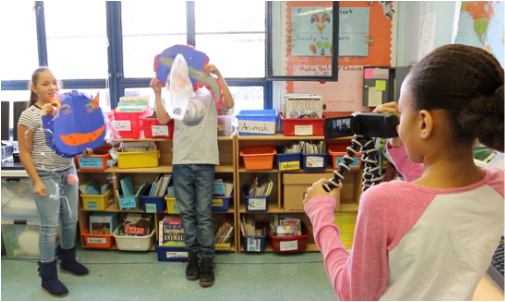 PS 15 K 5th grade students with ther marine creature masks, rehearsing their original skit about plastic litter that becomes deadly marine pollution. 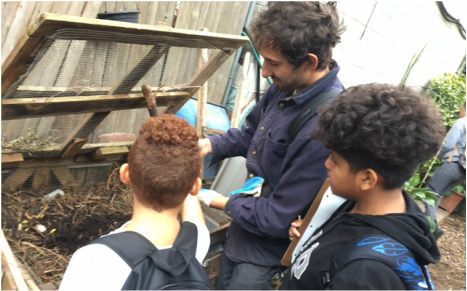 PS 34 5th grade students visit El Sol Brilliante, an East Village Community garden, to learn what actually happens to food scraps when they are composted. 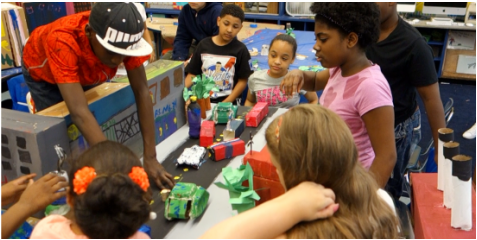 PS34 M students studied the history of their neighborhood, then made current-day observations and designed their dream neighborhood of the future. NEST+m lower school Cafeteria Rangers on the job as zero waste leaders at the end of lunch period. NEST+m won a 2016 Golden Apple Award from NYC Department of Sanitation! 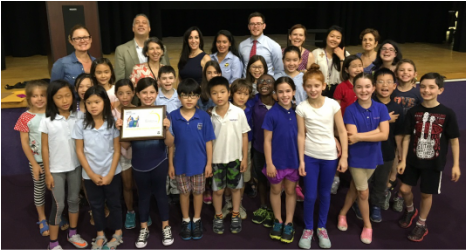 Pictured: Ms. Wilen's third grade class with Manhattan Deputy Borough President Aldrin Bonilla and NYC Councilwoman Rosie Mendez. NEST+m, a K-12 school of 1700 students, scored amazing waste reduction results starting on Launch Day of the Cafeteria Ranger Program! PS 15 K - Pre K and K students sort in their classrooms after breakfast, lunch, and snacks. 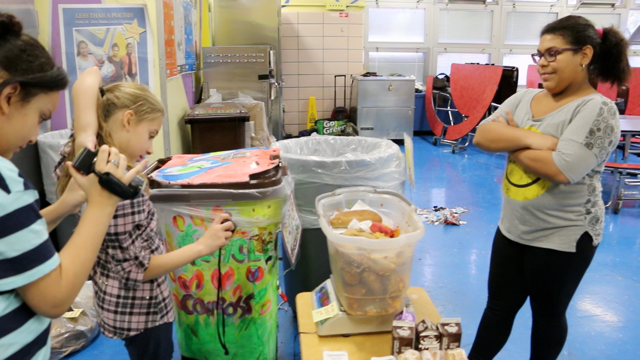 The Cafeteria Culture team in partnership with PS 15 K Pre K and K teachers led a zero waste classroom pilot program. We tested our original Pre-K and K sorting songs and sorting games with the school's youngest students. They are doing a fantastic job with compsoting thier food scraps, sorting thier recyclables and reducing garbage. 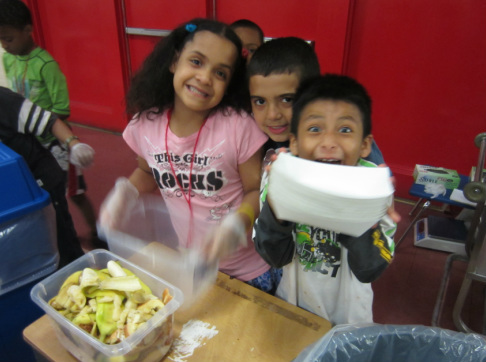 PS 15 K is a designated Zero Waste school as part of New York City's Zero Waste Schools Initiative. We are very happy to be continuing this effort, working with NYC Department of Education Office of Sustainability and GrowNYC at this school. 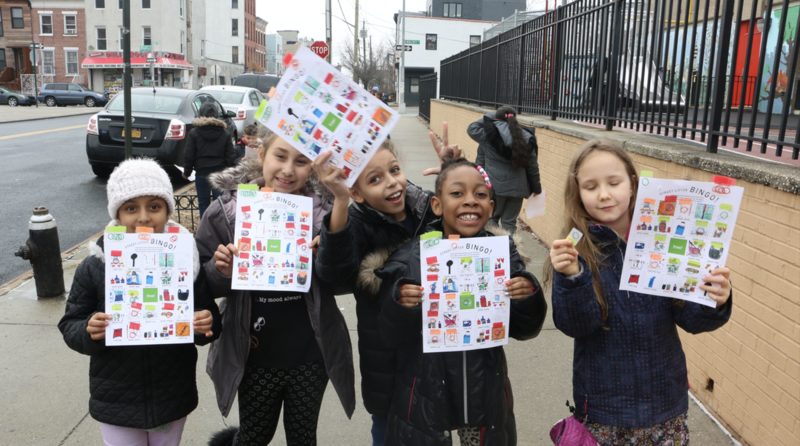 PS 34 M students paraded with puppets to Union Square to share the great news that NYC Schools were officially rolling out the new compostable school food plates! 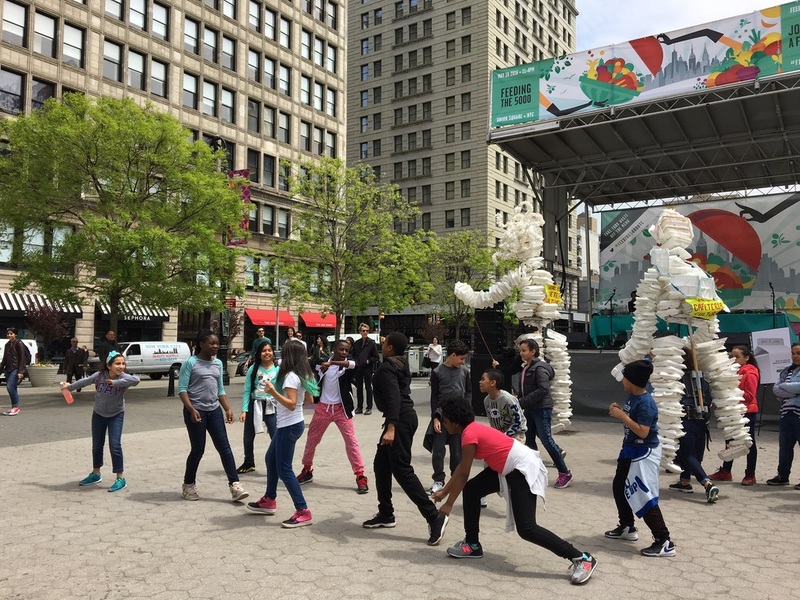 As of September 2015, all NYC public schools have switched from styrofoam to paper pulp. 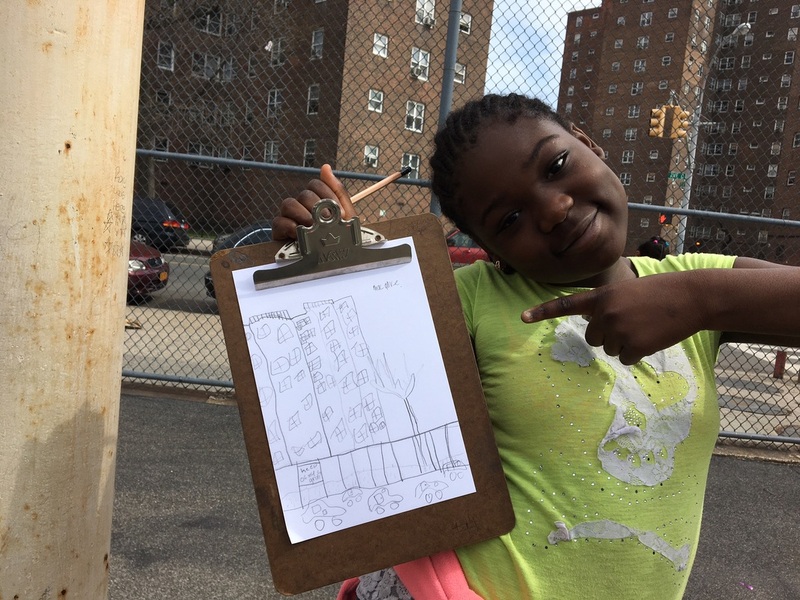 PS 34 M students surveyed neighbors and the community about recylcing habits at home at at work. 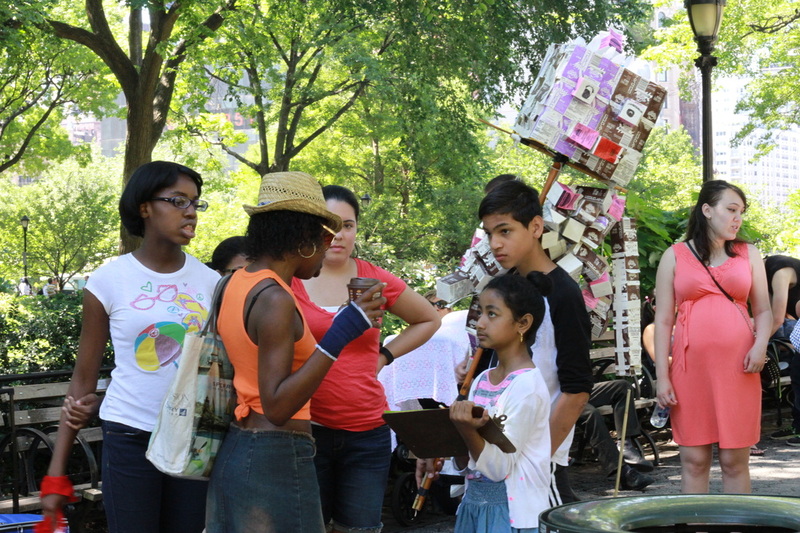 "I Am Not Trash" backpack pole puppets created by PS 34 M students and taken outside to help educate NYCHA community neighbors to recycle. 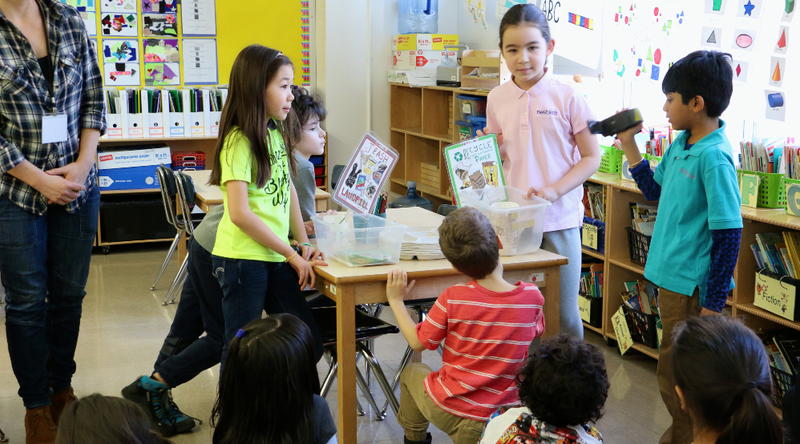 Fifth and third grade students from PS 34 M conduct plate waste audits as part of a financial literacy and environmental education pilot program. 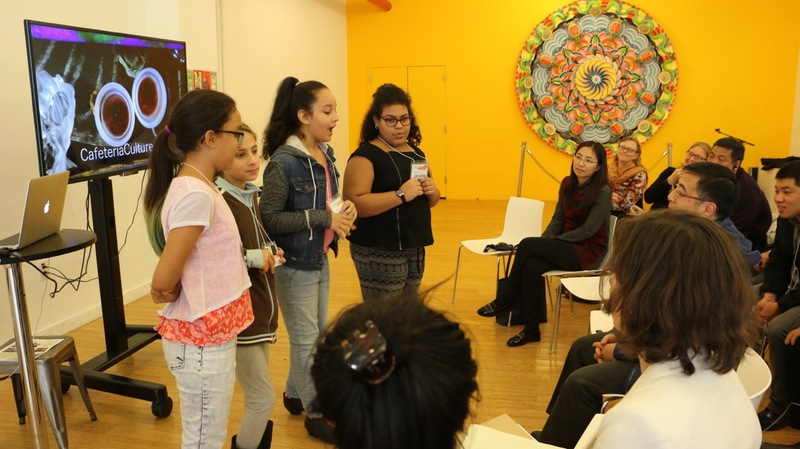 Cafeteria Culture brought together 100 4th- 5th graders from 3 schools for a Roundtable discussion with City Council Member Rosie Mendez on NYC Council's pending Bag Bill. Students and teachers from the Earth School, Children's Workshop and PS 34 M were prepared for the discussion and had many opinions and ideas to share with City Council Member Mendez. 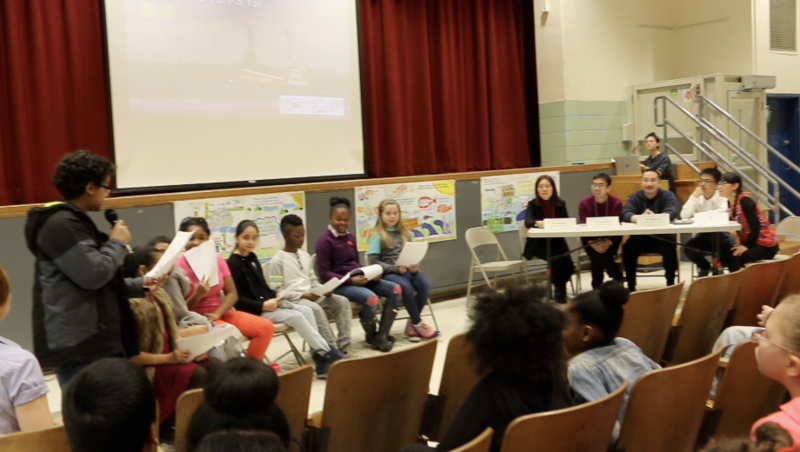 Fifth grade students from PS 34 participated in a Socratic Discussions on the topic of NYC Council proposed sing;e-use, carryout Bag Fee Bill. They also made reusable bags by repurposing tee-shirts! Students have been took their no-sew tee-shirt bags out to the neighborhood to give away for free, promoting reusable bags and the reduction of plastic bags. MS 246 Walt Whitman - LAUNCH DAY, January 14, 2014: pictured on left, JUST 2 small bags of garbage from 500 meals served; right, recyclables and food scraps diverted from landfills and incinerators. 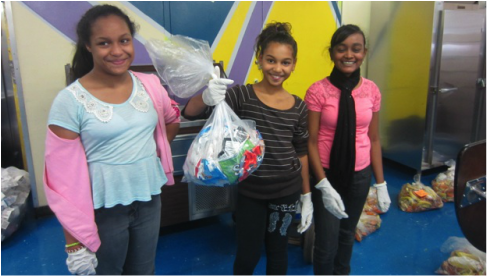 Students decreased cafeteria curbside garbage from 10 bags per day to just 1 bag per day on the launch day of our program! 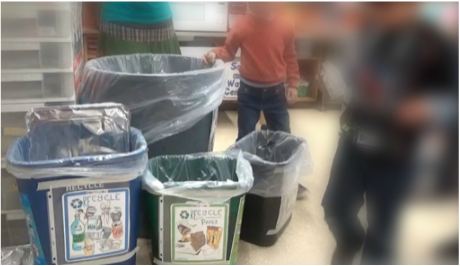 On ZERO-WASTE CHALLENGE DAY, both schools combined had only 1.5 pounds of garbage. 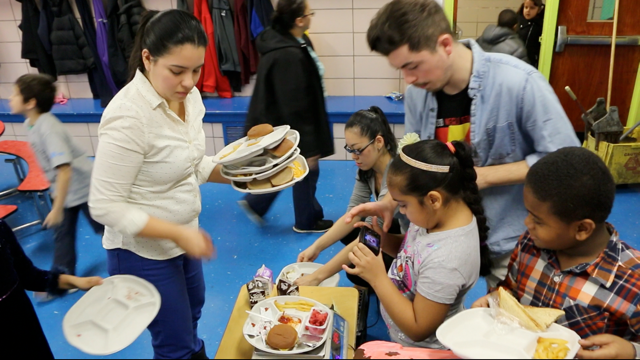 Cafeteria Culture piloted our first community organization collaboration with CIVITAS, which is dedicated to improving the quality of life in East Harlem and the Upper East Side. The CafCu team trained CIVITAS adult volunteers to lead our Cafeteria Waste Reduction program. 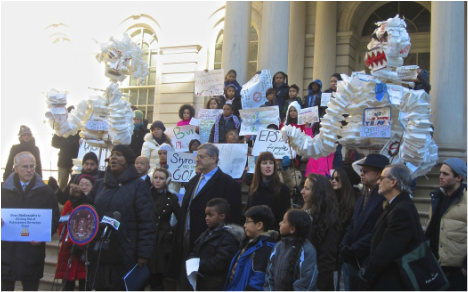 PS 34 students partnered with Cafeteria Culture, 15 other organizations, and elected officials to help get styrofoam banned in NYC! PS/IS 34 M 5th grade environmental advocates, participating at City Hall Rally on the styrene foam ban with NY City Council Members James and Fiddler and environmental advocacy groups (November 25, 2013; photo, Atsuko Quirk). 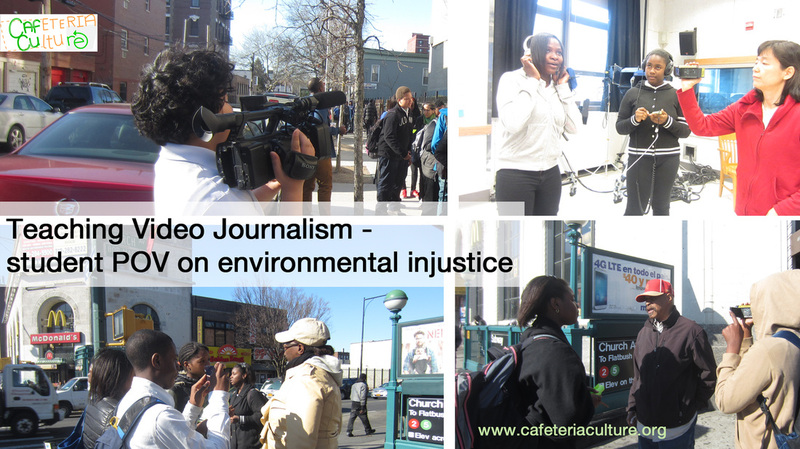 Eighth grade students from MS 246 Walt Whitman worked in teams on production of 11 short PSA type videos. 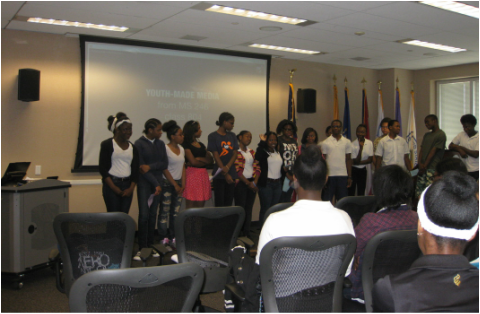 Students presented finished videos at screening at the US Environmental Protection Agency Region 2 Office. MS 246 students presenting their video shorts at the US Environmental protection Agency, Region 2. 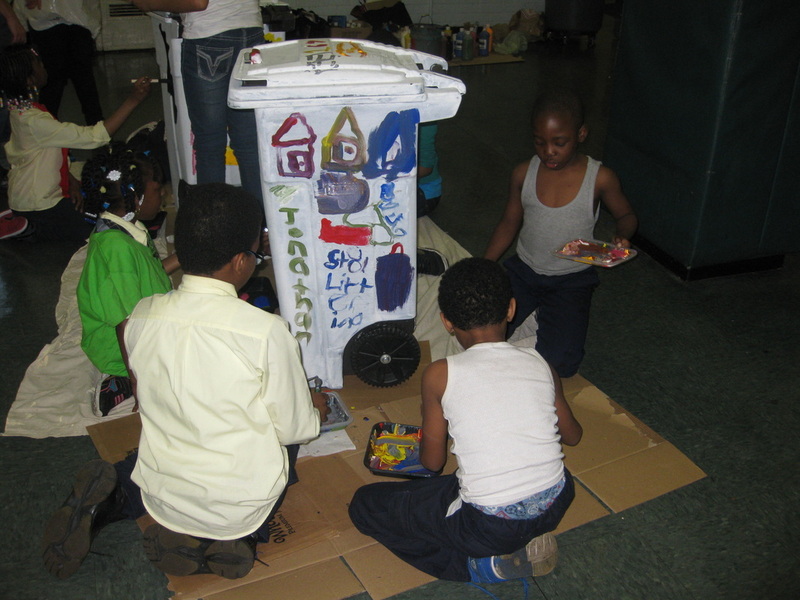 Students at PS 167 The Parkway School (Brooklyn) learned about compost then, students worked in groups to design and paint moving messages on the school's organic totes (aka rolling compost bins). These beautifully painted totes are set out on the curbside every day in front of PS 167, brightening up Eastern Parkway with colorful student messages about composting and caring for the earth. 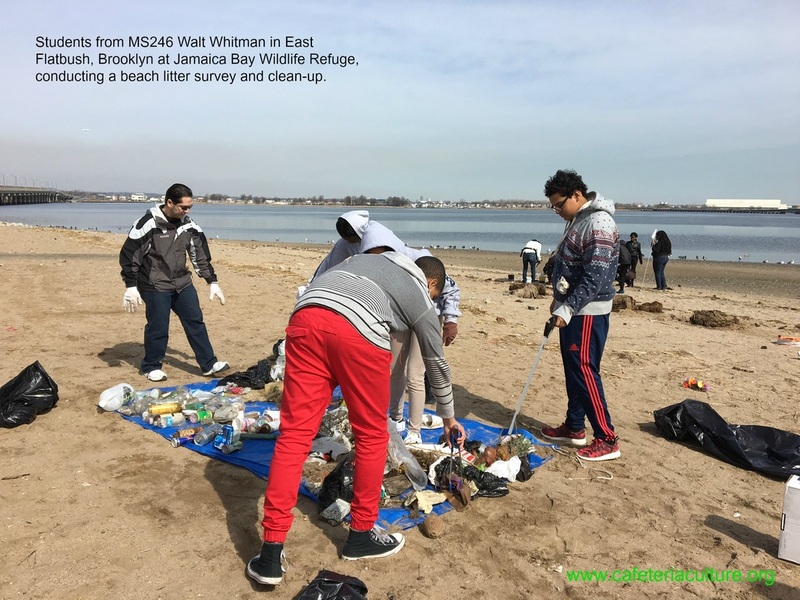 Students from MS 246 Walt Whitman were excited to test out new plates and to give feedback that was used for schools in all 6 cities that switched from styrofoam to compostbale. 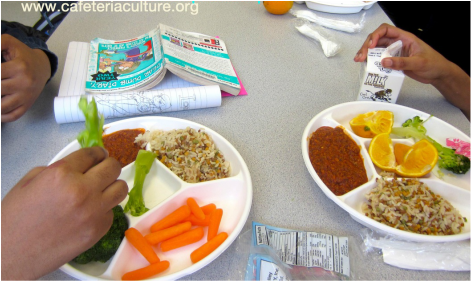 Students and School Food staff from Cafeteria Culture's partner schools, MS 246 K, PS 221 K and PS/MS 34 all helped with the piloting of various types of possible new school food plates. 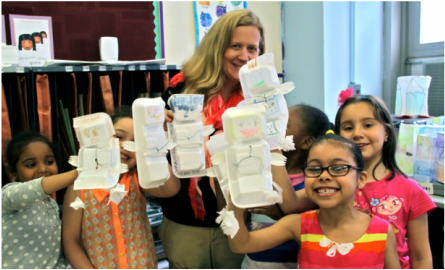 Cafeteria Culture taught PS 20 second grade students about Climate Change, math, data, and Art via the construction of hand puppets and a giant polar bear puppet. Student Rangers oversee all recycling, composting, and sorting in the cafeteria. They take ownership of the program! Student Cafeteria Rangers from PS 63 Manhattan - The Star Academy. 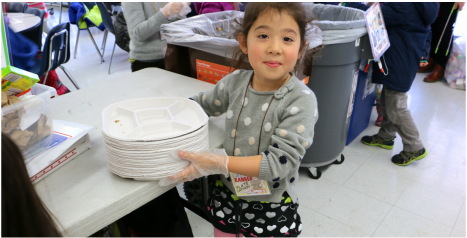 Students dramatically increased waste diversion rates from 3% to 85%, decreased cafeteria curbside garbage from 9 bags per day to 1.5 bags per day, and composted all food waste locally! 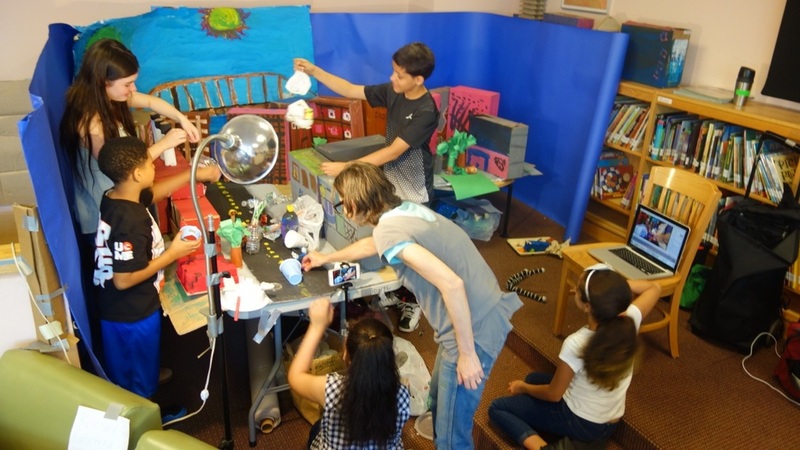 Fifth graders designed and constructed fantastic giant puppets made from hundreds of used plastic foam lunch trays and performed an original play about plastic ocean pollution. 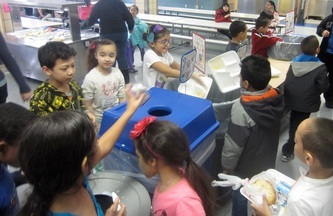 All students, including Kindergarten and Special Needs classes, oversee cafeteria recycling, composting and sorting. 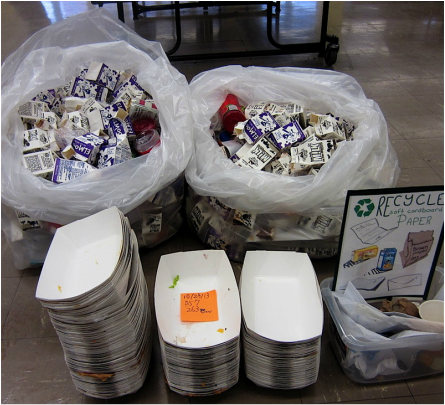 Student Rangers reduced cafeteria garbage from 14 bags to just 4! Second Graders learned about Climate Change and built a giant polar bear puppet. 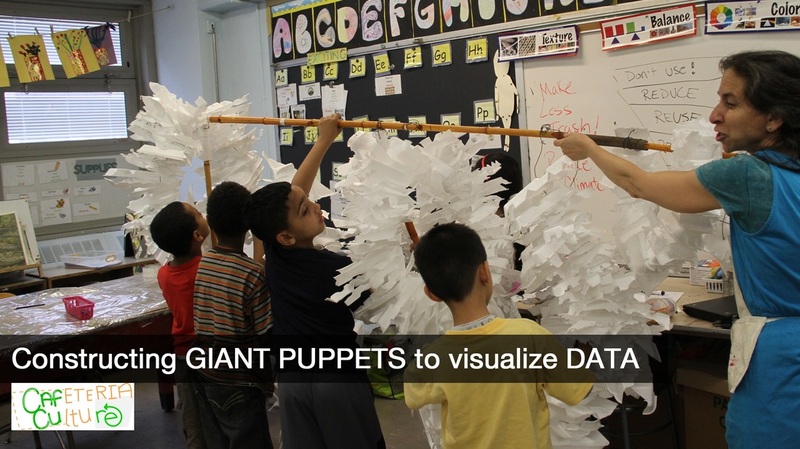 Leading students in the creation of entertaining messaging “campaigns” (such as designing giant puppets or animated shorts) to engage students and staff on the topic of garbage. Training starts with “ Garbology 101” lessons in each classroom. 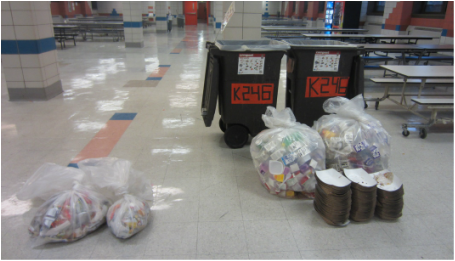 All students and teachers first learn “why” sorting in the cafeteria is so important and how our massive amounts of garbage connect to environmental justice and climate change issues. 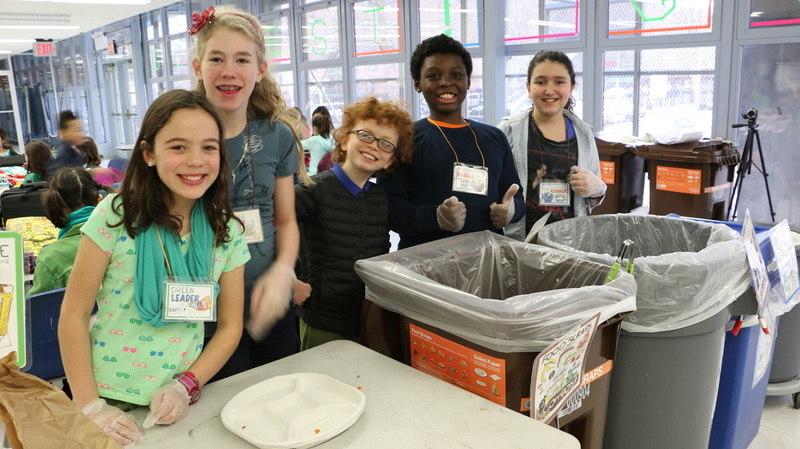 Students practice recycling and sorting basics through songs and games and then engage in hands-on, real-world problem solving during the lunch period as leaders in their cafeteria. 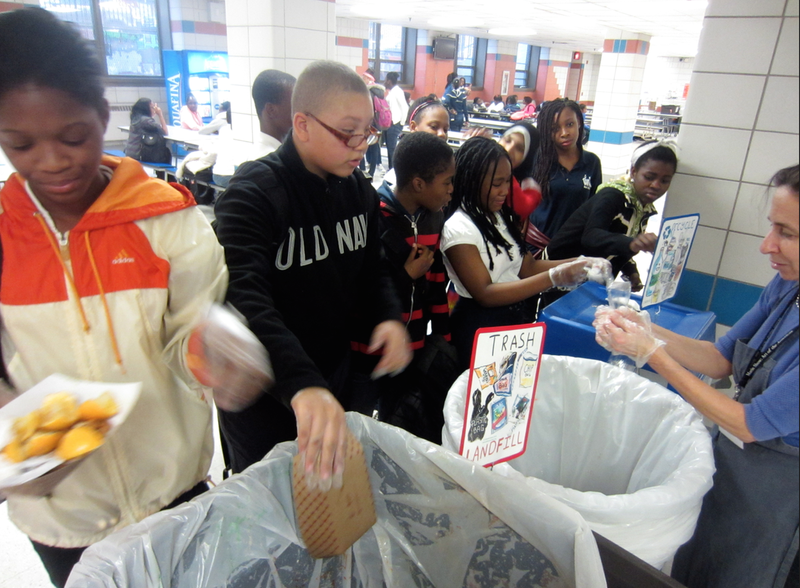 Student Cafeteria Rangers oversee all recycling, composting, waste sorting, as well as learn how to conduct waste audits. This strategy has been hugely successful, and also can help to foster positive community spirit of respect in the cafeteria. 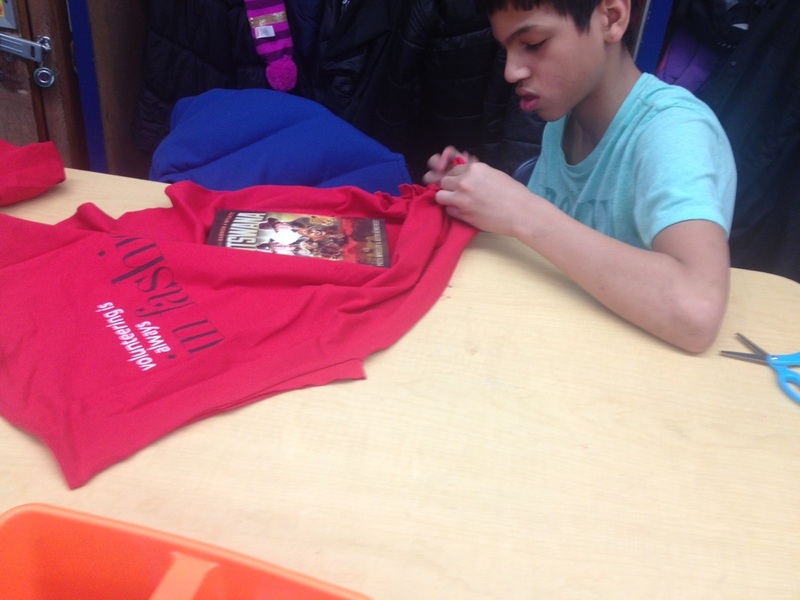 In-class, interdisciplinary workshops are taught to a 1st - 8th grade classes. 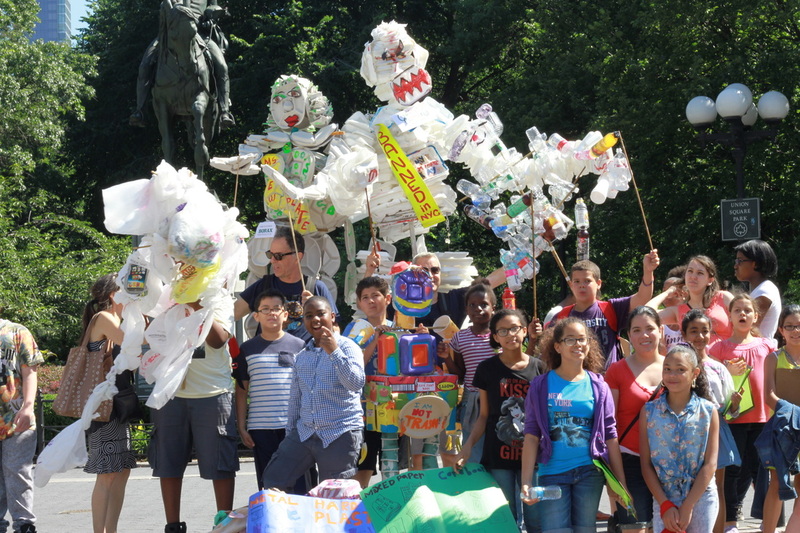 Lesson Units include: students as advocates - taking action to promote a zero waste culture; math - using real school waste audit date; Change Makers in American history; and Socratic discussions (asking questions such as, ”Is achieving a zero waste New York City by 2030 possible?”). 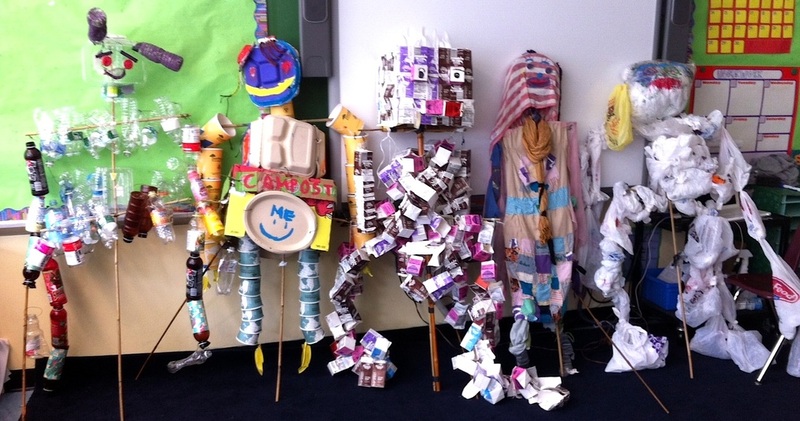 The culminating project is the design of an entertaining messaging “campaign,” such as the construction of large puppets or an installation in order to gain buy-in from the entire school and neighboring community on the topic of garbage reduction. Workshops may also include student video documentation - students learn how to use video cameras and how to conduct project related interviews.